A Whole Lot of Noodle Pushing Goin' On! The point is again missed by the city and the council - that there is a zoning/density issue behind all the unrelated polemics on single family residency. (Click here to read the Herald story on the 23 Jun City Council Meeting.) I have presented this from many angles since last July in this blog as is known by those readers who remain interested in the relevant issues on the subject of illegal rooming houses. Changing the rule from 3-4 does nothing except change a number in the code which is not enforced anyway. Doing away with the definition of family throws into extreme disarray any notion of single family zoning. Because there is no "perfect" solution to the problem (Thank you for this observation, Mr. Stewart) does not mean there is not a good or very good one. Try true enforcement of present codes for once. That might work instead of talking the issue to death. I am happy to hear from Chief Ramsay that the number of letters sent to landlords this year has dropped, however, that is not a measure of an amelioration of a zoning/density problem. Until the council acts on demanding enforcement, I would not believe anything they or Mr Stewart promise about infill (e.g. the neighborhoods decide "the where") since both (including former Directors of Planning) have allowed illegal infill to take place for the last several decades. The truth is that "the where" is controlled by landlords. Keep that in mind. We Do Not Know. But Do We Want To Know? A friend forwarded the message below to me about the same time I received a note from a former Bellingham resident (now in California) about rental problems in San Diego, problems revolving primarily around students seeking housing. One of the main issues in sunny San Diego is the creation of extra rooms in single family residences by landlords attempting to maximize their income on the property. There they refer to these rentals as “mini-dorms”, a cute euphemism for the equivalent of our de facto rooming houses. You can read stories from the local San Diego press on this issue by clicking here and here. Accommodating students in planning for infill is absolutely necessary. They are not potted plants. San Diego has done very badly. Bellingham, with the tacit concurrence of Western Washington University and other post-high school institutions, has done little for the past several decades except let the situation develop. Sand found. Hole dug. Head inserted. So my friend writes: “All over town. Another wrinkle. A neighbor (retired fire dept) called the inspection wing of the BFD [Bellingham Fire Department], requesting a inspection of one of the rooming houses in our neighborhood, as he felt it was a very unsafe house for those living there as some of the "added" bedrooms have no proper exits in the event of fire. Fire dept informed him it’s a Permit dept problem, Permit dept states it a law enforcement problem, law enforcement has been told by the city attorney’s office to "do nothing". Do not motels, hotels, licensed group residences, etc have to be inspected by the BFD for safety? Meeting rooms have a max capacity set by the BFD! Sure do enjoy merry-go-rounds.” I have written on this subject before. Click here and here to read those blog entries. Click here to read about a house fire near Miami University in Ohio in 2005. Three students died. 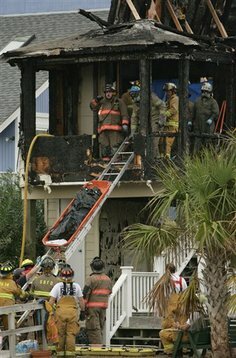 Many will remember the house fire at Ocean Isle, North Carolina last year. Below right is a photo of what is left of that structure. 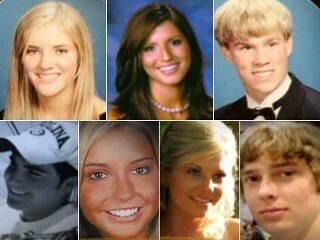 Seven students (pictured below) died. Click here to refresh your memory. From Firehouse Magazine (July 2005) there is this, "A nationwide campaign is underway to reduce the number of fire deaths at colleges and universities, with special emphasis on off-campus housing, where more than 75% of these fatalities occur." Did you know that? Have you heard of such a campaign in Bellingham? What sort of liability is the City of Bellingham courting by not having a landlord law under which single family rentals can be inspected for safety? Fifty percent of our single family homes are rented but we have no idea regarding the condition of these structures. You can train the renters but if the basic amenities, which provide the house with a secure environment, are missing, all the training will have been for naught. For more on this subject, read an article entitled "After N.C. deaths, fire safety concerns come to light" in the Tufts Daily by clicking here. A further example: "The fire call came in at 4:50 am … careless smoking on that porch had set that old wooden house ablaze … there was only one way out and it was through the porch. There were no sprinklers and reportedly not all of the smoke detectors were working. Liz and two of her roommates died of smoke inhalation that day." More information on this incident and on off-campus fires can be found at Campus Firewatch by clicking here. Here are some nationwide statistics from Campus Firewatch. Dean Kahn has provided a summary of Planning Academy II where a number of new housing types, i.e., “the what” were presented to and evaluated by the attendees. (Click here to read his article) The imbedded bugaboo, i.e., “the where”, is yet to be decided although one does find some extant examples in Bellingham. I submit that there is a third component, which is “the how” and therein lies a greater problem...of which few speak. We already have examples of “the what” and “the where” which may provide clues to “the how” of the future. It may be instructive then to look at the presentation made during the Planning Academy II wherein the “stakeholders” saw photos of the various types of alternative housing, “the what”. You can view these photos by going to the City of Bellingham website dedicated to the Planning Academy by clicking here. The photos are remarkable in that it appears that they had been taken on the set of “On the Beach”, a 1959 film in which a submarine crew, protected by being underwater during a massive nuclear weapons exchange, returns to the west coast to find the cities devoid of life. Similarly, we are presented photos of these housing types, “the whats”, in a remarkable state in which people, cats, dogs, cars, trash do not play a role. Let’s look at some Bellingham reality with regard to homes on “small lots” which include town homes, duplexes/triplexes, cottages or whatever. These are “snout houses” (with protruding garages in front) on small lots along Ashley St. Click on each photo to enlarge for full effect. Here are some small lots on a cul-de-sac off Consolidation St. This is a morning panorama on a street in the Magnolia Hills subdivision. So now we arrive at “the how”. Here is how the city tends to enforce housing codes. These examples were found in a matter of hours in widely scattered neighborhoods and are surrounded by modest and well kept homes. The question for the citizenry is, “How ('The How') will the City Council and the city government enforce future codes on the housing described above when its efforts to date have allowed for a proliferation of illegal rooming houses, derelict homes, and residences where boats, trailers, cars and various sorts of containers are treated as lawn ornaments?” I know that our new Chief of Police, Todd Ramsay, is working diligently on a method of enforcement but will the political will of the Mayor and the City Council be there at the moment of implementation?